1.Preheat oven to 375°F. In small bowl, whisk together garlic, lemon juice, oil, lemon zest, paprika, salt and pepper. Place chicken in large zip-top plastic bag; pour lemon mixture into bag. Seal bag, pressing out excess air. Massage ingredients in bag to combine; marinate 10 minutes. 2.From lemon, cut four 1/4-inch-thick slices. Remove chicken from marinade; discard marinade. In large oven-safe skillet, melt butter over medium-high heat. Add chicken and cook 3 to 5 minutes until 1 side is browned. 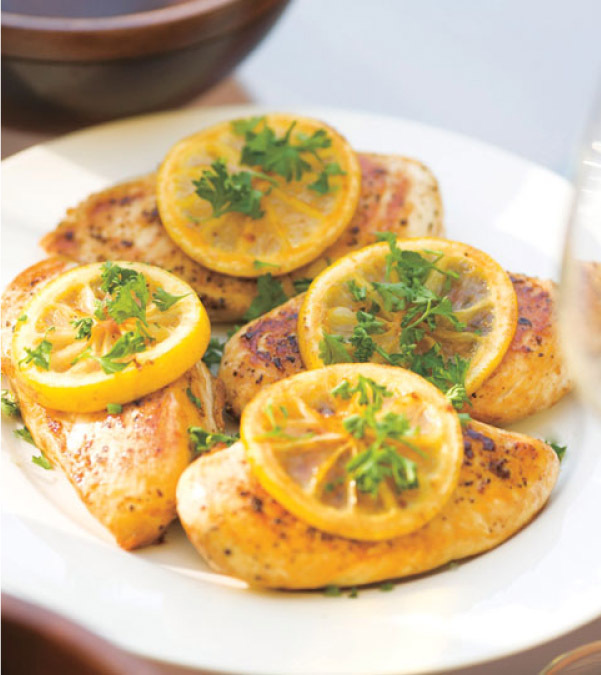 Remove skillet from heat; turn chicken breasts and top with lemon slices. Bake 10 to 12 minutes or until chicken loses its pink color throughout and internal temperature reaches 165°F. Transfer chicken to plate; keep warm. 3.Place skillet over medium-high heat. To deglaze pan, stir in wine. With wooden spoon, scrape browned bits from bottom of skillet. Cook 3 to 5 minutes or until wine is reduced by half. To serve, spoon sauce over chicken and garnish with parsley, if desired.